"Theresa and Don are fantastic, professional agents. Our house sold in 5-6 weeks start to finish. No glitches, they managed getting repairs done, cleaning, and painting, staged it, and it sold straight away. And above our asking price! These guys are full value." 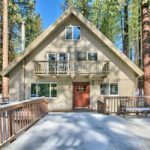 - Sold a Home in 2017 for $475K in South Lake Tahoe, CA.